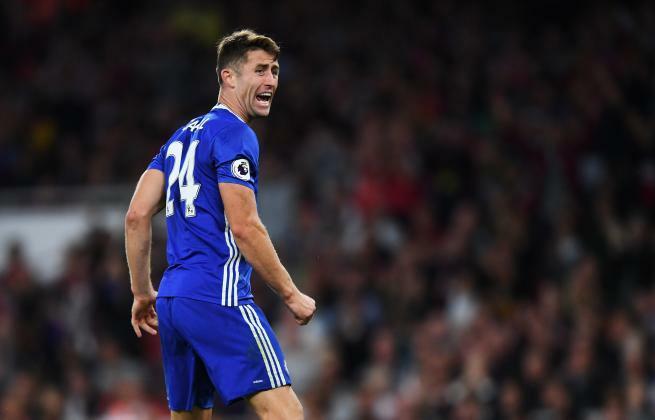 Gary Cahill has had a tough time with Chelsea and England over the last twelves months but after impressive recent performances has hit back at those who doubted his ability. Chelsea were woeful last season and the same can be said of England in Euro 2016 as they were knocked out at the group stages and forced to fly home much earlier than expected. Chelsea as we all know and have had it rammed down our throats more than enough times, finished tenth in the Premier League, the worst title defence on record so far. As with everyone else, Gary Cahill was singled out for criticism during that period and again at times this season after some poor defensive displays collectively and personally. Cahill had been caught in possession of the ball in defence twice in the space of two weeks that had cost Chelsea goals and most importantly Premier League points. I hold my hands up and admit that I have slated Cahill at times because that’s how he had played. I am of the opinion that by playing in a back four, as one of the two centre backs, Cahill needs someone alongside him to talk him through games such as John Terry because without him there he is a different player. He almost plays as if he lacks confidence in the person next to him and tries to do everything himself. As a result he either gets dragged or caught out of position leaving us exposed. After the nightmare defeat at Arsenal a couple of weeks ago, it became clear that something had to change and that was our defensive formation. Antonio Conte has deployed Cahill on the left hand side of a back-three and so far it has worked a treat as we have won four out of four, keeping four clean sheets along the way with Cahill looking solid alongside David Luiz and Cesar Azpilicueta. It’s worth noting however just how much Luiz talks to those either side of him in games which without question helps Cahill. “Don't write me off, It's easy to criticise someone after certain games and it's fair enough. Sometimes you haven't had a good game. But people are very quick to write people off. If you are at the top level you have to be mentally strong. For me it was a matter of time before I turned the corner and got back to the performance levels that I should be at. The last four games I'm back to where I should be, I'm playing well, I feel good. We talk about character of the team, but sometimes you have to show character yourself and that's what I feel like I have done. I will never go away from a game having played badly and dust it off as if it doesn't matter, that's just not me. Everyone deals with things differently, but I certainly reflect. I sometimes beat myself up personally, but in terms of my frame of mind, when things don't go well, I want to be there. But the manager comes into this as well. There was a time, maybe after Arsenal away, where I could have been pulled out of the side, but he showed belief in me. That is the most important crucial time because when you have a bad spell or a bad game, the first thing you want to do is play again. I'm not the kind of person to shy away and think 'things aren't going well so I'll take a back seat. I have turned the corner, produced performances in the last few weeks and I'm pleased.” Source - Daily Mail. I have never doubted Cahill’s ability to defend especially in one-on-one situations. He is arguably one of the best there is in looking to block shots on goal. How many times has he done that for us since he signed from Bolton for just £7m? As I said, it’s just his positional sense that had been lacking. Without question there has been a vast improvement in our defending both as a team and as a backline with Cahill more than playing his role. The more the players work everyday at the formation, their defensive positioning and of how Antonio Conte wants them to perform, we can only get better and better. Gary Cahill has taken a massive step forward in the four recent victories we have had playing as a back three and long may it continue.